One of the most memorable dishes I ate during a recent trip to Israel was also one of the simplest. Char-grilled red bell peppers were doused in vinegar, extra-virgin olive oil, fresh basil and the softest, saltiest feta I'd ever tasted. I've recreated this dish at home more times than I can count - the key to success here is using the best extra-virgin olive oil you can find. This low-carb 30 minute Mediterranean dish is sure to find its way into your frequent meal rotation as well! 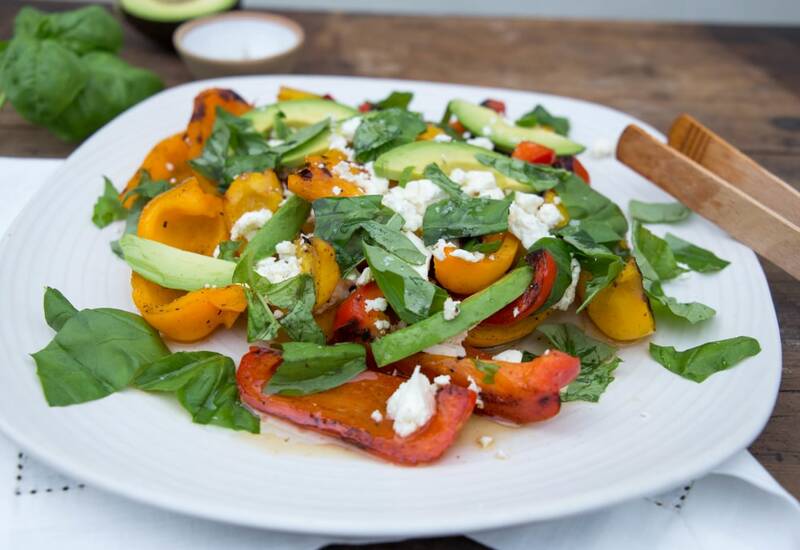 For a spicy kick, char a jalapeno or serrano pepper on the grill alongside the bell peppers. Chop it up and scatter it over the peppers. Per Serving: 153 calories; 13g fat; 8.2g carbohydrates; 3g protein; 13mg cholesterol; 543mg sodium. Never would have come up with this combo - but it will be in my regular rotation from now til end of time. Brilliant balance of flavors - sweet, smoky, salty, rich, fresh.... perfection. I also fell in love with feta in greece, and use it every chance I can! This dish was so easy, but also incredibly delicious. I didn't really start to like peppers until I became an adult, but now I'm obsessed with them. The goat feta and bail really gave it that Mediterranean feel that I absolutely love. I enjoyed this very much! Perfect summer and entertaining! I did a basil and kale mix, and it was delicious. Added jalapeno peppers on the grill with grilled peppers. I really like the sweet and spicy combo. This is perfect for summer nights. You had me at feta and basil. Whenever my friends fire up the grill, I make this recipe. It's also great for vegetarians or pairs well with steak.